(Nanowerk News) A team from the University of Illinois at Urbana-Champaign and Indiana University combined two techniques to determine the structure of cyanostar, a new abiological molecule that captures unwanted negative ions in solutions. When Semin Lee, a chemist and Beckman Institute postdoctoral fellow at Illinois, first created cyanostar at Indiana University, he knew the chemical properties, but couldn't determine the precise atomical structure. Lee synthesized cyanostar for its unique ability to bind with large, negatively charged ions, which could have applications such as removing perchlorate, a commercially produced contaminate that has been associated with negative effects on human health, from water and soil. Determining the structure of a molecule, atom by atom, is important for both chemists and biologists to understand how molecules work and interact with surrounding material. In the past, each discipline had different ways to determine the structure based on the molecule's size and complexity. To achieve the highest degree of accuracy, however, scientists have combined methods from both disciplines to determine the complicated structure of cyanostar, a symmetrical, five-sided macrocycle that is easy to synthesize and could also be useful in lithium ion batteries. These results are detailed in a paper recently published in the Journal of the American Chemical Society ("Macromolecular Crystallography for Synthetic Abiological Molecules: Combining xMDFF and PHENIX for Structure Determination of Cyanostar Macrocycles"). "There are two worlds which determine structure--the world of biology, which has big systems but often doesn't generate precise structural calculations," said Klaus Schulten, head of the Theoretical and Computational Biophysics Group (TCBG) at the Beckman Institute for Advanced Science and Technology at Illinois. "Then there's the chemical world of smaller molecules, which results in super-precise calculations, but often can't account for disorder in the molecule." Disorder--when a molecule has more than one way it can arrange itself--challenges traditional small molecule methodologies. Cyanostar, for example, can be arranged in four different ways. To overcome the challenges of the disorder, Lee collaborated with Schulten's group, including Abhishek Singharoy, another Beckman Institute postdoctoral fellow who specializes in a computational simulation method called xMDFF (Molecular Dynamics Flexible Fitting). The method uses x-ray crystallography data to examine a molecule's structure. "In x-ray crystallography, we don't look at single molecule," said Singharoy. "We look at a bunch packed into a single crystal, and shine an electron x-ray on it. This produces a diffraction of the crystal structure. It's still tricky to get a good image with a disordered molecule, so we had to use another program to refine the structure further." The team combined xMDFF with PHENIX, a popular tool in the crystallography community developed by a group at the University of California, Berkeley. "It's really an excellent combination of the two programs. We wouldn't have gotten the results we did without this computational partnership," Schulten said. "This entire project is really a wonderful example of how today's science is being done. The disciplines joined, the teams joined, and the computational programs joined. When you are open-minded and look to see what others can do, you are really better off." The team, with the help of Chris Mayne, a research programmer in TCBG, also created specialized force fields, a set of rules that helps the computer program govern the connections between the molecules. 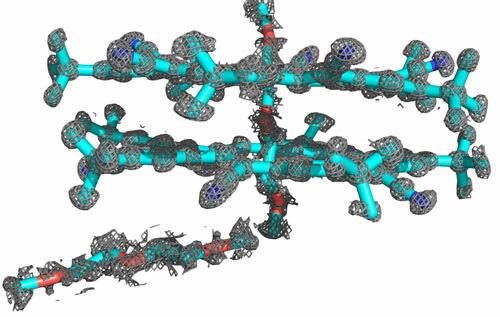 "The connections in biological (large) molecules are well studied because they are so common--they're lipids, nucleic acids, and proteins," said Mayne. "But cyanostar is an abiological molecule, so it's not constructed from the same set of biological building blocks. It required a customized force field, so we had to start from scratch." With these newly developed force fields, the researchers could not only solve the structure of cyanostar, but it will allow the researchers to examine many more disordered abiological molecules. "It opens an entire avenue. We can use these sorts of techniques to obtain the structures of multiple classes of abiological molecules," said Singharoy. "So that's where we'd like to go moving forward--use it as a general tool to start these other molecules."